Today, we made it over to the show at around 930a. We started right back where we ended the previous evening. There were a few tables we had missed along the way, which is completely understandable given the sheer volume of dealers in the showroom. If you’ve never been to a National before, just think of a Costco sized warehouse full of dealer tables. It’s really quite intimidating. As I mentioned in my entry for Day One, my shopping strategy has changed to cater to the show environment. If for some reason I see a card at a both that I like but for some reason, I’m still on the fence, I go ahead and buy it. If I set it aside and tell myself to “think about it” and come back later, it will never happen because I will forget where said table is located. It’s a mental challenge to try and figure out where you are in the showroom at any given moment. Sure, I could grab a map and focus on location for the entirety of the show, but where is the fun in that? There is something special about getting completely lost in the hobby, which has a literal and metaphorical meaning. On one side, I am saturated mentally with the hobby via the incessant searching through boxes and showcases. The time just seems to fly by. On the other hand, while at the show, I am in a completely new environment and am literally lost in there tirelessly trying to make a cognitive map of the floor. In all essence, however, it’s a good mental challenge. In an endless search for Frank Thomas cards that I don’t already have, pickings are surprisingly slim. This can be chalked up to two reasons. The first reason is that I’m in Baltimore and Frank Thomas cards just aren’t all that abundant. The second reason being that I’ve gotten to the point in my collection where it’s getting harder to find cards that I don’t already have. I do focus on a particular decade and the items for which I am still seeking are incredibly scarce. Regardless, however, I’ve been really enjoying the process of serendipity. While searching for Thomas cards, I have found a lot of great non-Thomas cards. 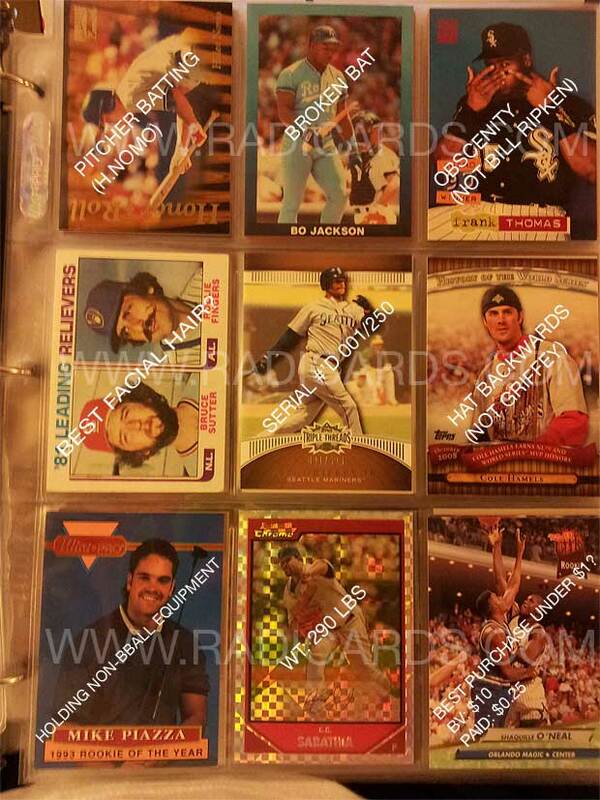 As I have stated in previous entries, I am a huge fan of flashy, gaudy, ’90’s inserts. I found a few today along with some really odd ball cards. Rad pickups and very affordable. Both characteristics of which I am a fan. So how is the Scavenger Hunt coming along? Let’s talk about it! 2012 National Sports Collectors Convention Scavenger Hunt – the update. I’m only two days into the show and I have located 9 of the total 18 cards on the list. I could talk about what I found but I’m partial to the use of visuals where necessary. In other news, we still haven’t tried any of the show exclusive redemption programs. We’ll see if we can get in on some of those tomorrow. To my knowledge, those play to the tone of, buy a few eligible packs at a dealer table, get a voucher, bring the voucher and pack wrappers to the company booth and get a redemption product. This scenario has the potential to yield some interesting finds. We’ll see how it goes. The scavenger hunt looks more fun than I expected. Takes me back for sure. Thoroughly enjoying your coverage of the National. Keep em comin. Thanks Bryan! It’s been a lot of fun.